Early intervention (EI) services are implemented to support families of eligible infants and toddlers, ages birth to 36 months, who have developmental differences including delays, disabilities, or atypical development. Services are individualized to each child’s and family’s unique routines, activities, and interests and are provided in natural settings such as the family’s home or other community locations (e.g., childcare, playgroup, local park). Which service a child and family receive is determined by the team who partners with the family to develop the child’s Individualized Family Service Plan (IFSP). EI services are based on the family’s priorities and desired outcomes related to the child’s development. For more information about eligibility, assessment, the IFSP, and supports and services in Virginia’s early intervention system, visit the Infant & Toddler Connection of Virginia (external website). For practitioners, information about procedures and practices can be found in the Infant & Toddler Connection of Virginia Practice Manual (external website). On this page, you will find a variety of resources related to the implementation of EI supports and services, including core competencies and other Virginia-specific information, free articles, handouts and other documents, presentations, discipline-specific position statements, videos, online learning, websites and other programs. Click the tabs below to review the resources. Virginia's comprehensive system of personnel development includes mechanisms to assure a basic level of competency for initial early intervention certification as well as continued development of expertise through the certification requirements and trainings offered under the auspices or approved by of the Infant & Toddler Connection of Virginia. All early intervention practitioners are required to meet Core Competencies 1.0 through 9.4 in order to provide supports and services to children and families. In addition to meeting Competencies 1.0-9.4, Service Coordinators are required to meet competencies 10.0-10.7. This table lists key quality practices that, when implemented, will have direct impact on child and family outcomes. Based on what they learned during training, practitioners across Virginia shared these statements as examples of how they will use what they learned when explaining supports and services to families. What TIDEWATER Learned about Describing EI Supports & Services to Families. What VALLEY Learned about Describing EI Supports & Services to Families. This document provides examples of what key early intervention principles look like and do not look like in actual practice. This handout is a resource for EI practitioners who wish to bring fewer toys to the home and focus on using the materials and activities found in families’ natural environments. This tip sheet was generated by service providers who participated in a Talks on Tuesdays web discussion on frequency and length of early intervention services. For more information, view the archived web discussion on the Talks on Tuesdays 2015 recordings page. Workgroup on Principles and Practices in Natural Environments, OSEP TA Community of Practice: Part C Settings. The “mission statement” reflects the broad over-arching purpose of family-centered early intervention services provided under Part C of IDEA. Principles are the foundations necessary to support the system of family-centered services and supports. Both the mission and principles were developed by the workgroup and reflect consensus opinion. The document reflects practices validated through several research, model demonstration and outreach projects whose developers were part of the work group. The practices suggest a flow of activities that need to occur during the IFSP process from first contacts through transition. Chapter 9 focuses on the EI record and includes general rules and requirements for contact note documentation, a checklist for completing contact notes and additional information for completing documentation for children receiving Early Intervention Targeted Case Management under Medicaid. This guidance document includes detailed descriptions and examples of what should be included in contact note documentation that align with coaching practices. The examples begin on the second page. Thanks to the ITC of Fairfax-Falls Church for sharing this resource. According to the document, “the purpose of this document is to help bridge the gap between research and practice by highlighting those practices that have been shown to result in better outcomes for young children with disabilities, their families, and the personnel who serve them.” Topics addressed include leadership, assessment, environment, family, instruction, interaction, teaming and collaboration, and transition. These one-page handouts address questions, provide information, and describe strategies to help early intervention team members integrate the child outcome indicators into their practices. For the full list of handouts, visit the Tools of the Trade page. This manual from Virginia’s Medicaid system provides guidance for providing and documenting Early Intervention Targeted Case Management services. The purpose of this document is to provide practical information and guidance for early intervention administrators, service providers and others. It was developed by parents and professionals in North Carolina. This handout addresses home visiting best practices, establishing rapport, boundaries, self-care and thinking safe, safety during visits, recognizing health and home safety issues, and what to do if there are safety concerns. This document was designed to assist state Part C programs, providers in professional organizations, and TA providers in understanding the alignment between the 7 key principles for providing early intervention services in natural environments and statements from various professional organizations (i.e., ASHA, AOTA, APTA, AAP, AAID, DEC, NAEYC, and NASP) that support the provision of Part C early intervention services. The document includes a matrix of the 7 key principles with corresponding statement from all of the professional organizations as well as individual matrices for each professional organization's statements aligned with the key principles. This series of handouts provides guidance to parents, caregivers, and early interventionists about what to do before, during, and after visits to get the most out of intervention. Handouts are also available in Spanish. City of Minneapolis Police Dept. This handout provides tips and strategies for safety pertaining to office procedures, being in the car, in the community, approaching the home, being in the home, and dealing with hostile/angry clients. Visit this site for performance checklists, practice guides, and other guidance materials designed to help practitioners and families understand and implement the Division for Early Childhood (DEC) Recommended Practices. These practices are organized by topics: leadership, assessment, environment, family, instruction, interaction, teaming & collaboration, and transition. This 4-page resource covers many safety tips about checking your agency’s policies, your car, tips for dealing with aggression during a visit, and many general safety tips to use before, during and after a visit. This handout offers 25 ideas for using items and activities found in natural environments to work on developmental goals instead of taking therapy materials out to the home. This article provides an overview of routines-based interventions and includes scenarios to illustrate early intervention using these practices. The importance of routines, effects of embedding interventions, and specific guidance on how to implement routines-based interventions are addressed. Check out this article written by an early interventionist that describes the work of the special instructor. Adams, R. C., Tapia, C., and The Council on Children with Disabilities. (2013). Early intervention, IDEA Part C services, and the medical home: Collaboration for best practice and best outcomes. (external website, pdf) Pediatrics, 132(4), e1073-e1088. This clinical report reviews the common purposes that the medical home and early intervention share, such as using a family-centered focus. Information about best practices in both types of care is provided, including how both systems can collaborate for best outcomes. This report is a great resource to share with physicians and other medical referral sources. Colyvas, J. L., Sawyer, L. B., & Campbell, P. H. (2010). Identifying strategies early intervention occupational therapists use to teach caregivers. (external website) American Journal of Occupational Therapy, 64(5), 776-785. In this study, videotapes of OT provider intervention visits were examined to determine routines used, the provider’s role, and strategies used to teach caregivers. Findings revealed that “explicit teaching strategies were rarely used” during intervention visits. Implications for practice are discussed. Dunn, W. (2007). Supporting children to participate successfully in everyday life by using sensory processing knowledge. (external website) Infants & Young Children, 20(2), 84-101. This article reviews Dunn’s model of sensory processing and describes how concepts from this model and knowledge of sensory processing can be applied in the natural contexts of everday life for infants and toddlers and their caregivers. Dunst, C. J., Bruder, M. B., Trivette, C. M., & Hamby, D. W. (2006). Everyday activity settings, natural learning environments, and early intervention practices. (external website, pdf) Journal of Policy and Practice in Intellectual Disabilities, 3(1), 3-10. This article summarizes findings from two studies that examined parent and child outcomes associated with different ways of thinking about early intervention practices. Results showed that using everyday activities as sources of learning opportunities were associated with positive benefits. Espe-Scherwindt, M. (2008). Family-centered practice: Collaboration, competency and evidence. (external website, pdf) Support for Learning, 23(3), 136-143. This article provides a historical overview of family-centered practices and research that has demonstrated the links between these practices and a variety of benefits for children and families. Mahoney, G. (2009). Relationship-focused intervention (RFI): Enhancing the role of parents in children's developmental intervention. International Journal of Early Childhood Special Education, 1(1), 79-94. 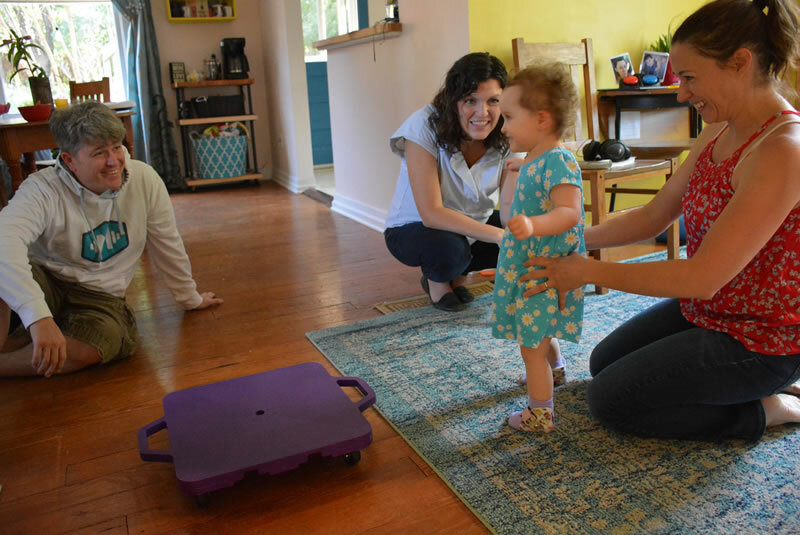 This article describes Relationship Focused Intervention (RFI) which attempts to promote the development of young children with developmental delays and disabilities by encouraging parents to engage in highly responsive interactions during daily routines with their children. Spagnola, M., & Fiese, B. H. (2007). Family routines and rituals: A context for development in the lives of young children. (external website, pdf) Infants & Young Children, 20(4), 284-299. This article provides information about the associates between variations in family rituals and routines and their impact on child development. Swanson, J., Raab, M., & Dunst, C. J. (2011). Strengthening family capacity to provide young children everyday natural learning opportunities. (external website, pdf) Journal of Early Childhood Research, 9(1), 66-80. These free interactive, multimedia modules support the implementation of the Division for Early Childhood (CED) Recommended Practices in all eight of the practice areas. The modules are designed to support learners in: 1) understanding and practicing using the DEC Recommended Practices in a risk-free environment, and 2) gaining confidence and competence in using the DEC Recommended Practices within their real-world practice. TThis module provides the information, resources and skills family support professionals need to engage fathers in home visiting and in their children's lives. family support professionals will learn how father involvement benefits children, and how mothers and fathers and will learn strategies for overcoming barriers that may keep fathers from being involved. Family capacity-building can be used where the focus of early childhood intervention is using early childhood practices that are implemented by parents. This approach can be used to promote parents' use of any type of early childhood practice, and includes strategies to engage parents in activities to build their competence and confidence in providing learning opportunities for their child. includes a family capacity-building checklist for self-assessment or planning home visits. This series of modules addresses the profession and effectiveness of home visiting, describes VA’s home visiting system, home visiting roles and skills, and professional practice behaviors, including documentation, boundaries, time management, and self-care. Home visiting is generally a safe area of practice. Occasionally, though, situations come up where a family support professional may be in an unsafe setting. This module will give family support professionals an overview of personal safety, describing what factors contribute to unsafe situations while traveling to and from the home visit and while in the home. The family support professional will learn how to prepare for home visits to ensure their safety and to recognize and avoid unsafe situations. The module will also show demonstrations of basic self-defense techniques. This module is not a definitive or comprehensive personal safety or self-defense course. The family support professional's supervisor should give additional guidance to ensure the family support professional's safety. This module reviews the basic rules of supervision, including understanding work styles, listening, providing feedback, etc. Chapters also address gathering and analyzing data; using what you know; team building and resolving conflict; personnel development and management; and planning and program development. Completion of this module takes approximately 2 hours and results in a certificate of completion. This web discussion series focuses on providing EI services in child care settings. In Part 1, we explore some of the challenges of providing services in child care settings and explore some solutions to the challenges. We answer your questions throughout the web discussion to help you consider how your program can provide services in child care settings. In Part 2, we dig deeper and discuss several challenging scenarios with a panel of experienced service providers, including an occupational therapist, speech-language pathologist, and developmental services provider. The panel will share strategies they use to manage these challenges, and we also invite the audience to share what's worked for them. Join us for a lively discussion as we get real about working in child care settings! Click the link above to visit the 2017 Talks on Tuesdays Archive and scroll down until you find the webinars. This archived webinar focuses on important elements of engaging families during intervention visits, from a family’s perspective. The presenter shares her experiences as both a mother of children who were enrolled in EI and an EI service provider. Content includes consideration of the relationship between early intervention services and families' everyday lives and how service providers can more effectively provide services and supports to families. Click the link above to visit the 2015 Talks on Tuesdays Archive and scroll down until you find the webinar. This archived web discussion explores patterns of frequency and intensity across programs and how we make these decisions about service delivery. Click the link above to visit the 2015 Talks on Tuesdays Archive and scroll down until you find the webinar. This webinar provides information about the concepts that form the foundation of early intervention practices, including a discussion of the Mission and Key Principles of Early Intervention developed by the OSEP Workgroup on Principles and Practices in Natural Environments. This information is then linked with VA’s initiatives to implement coaching practices and integrate the OSEP child outcomes into the IFSP process. Click the link above to visit the 2013 Talks on Tuesdays Archive and scroll down until you find the webinar. This archived webinar focuses on how to move early intervention off the floor, out of the toy bag, and into the routines that naturally occur in children and families' everyday lives. Content includes considering the differences between collaborative and traditional intervention and the relevance of still bringing a toy bag when intervention is routines-based and family-centered. The webinar also includes tips for making these practices successful. Click the link above to visit the 2015 Talks on Tuesdays Archive and scroll down until you find the webinar. Presented by El Brown, M.Ed. Join El Brown, a mother of a child with disabilities and an educator, to learn how to integrate family stories and perspectives to better engage families in early intervention. A process, structure, and framework will be shared to support your work as a practitioner. Click the link above to visit the 2018 Talks on Tuesdays Archive and scroll down until you find the webinars. This four part online tutorial series addresses documentation requirements, documenting ongoing assessment, quality documentation and documenting coaching and natural learning environments for contact notes written by early intervention providers. Follow-up activities are available for each section and a facilitation guide is included for use with groups. This webinar provides strategies for moving families from involvement in early intervention sessions to full engagement in embedding early intervention objectives into their daily lives. Click the link above to visit the 2013 Talks on Tuesdays Archive and scroll down until you find the webinar. Presented by Jen Newton, Ph.D. Your impact on families goes well beyond the time you spend with them. The words you use, the compassion you show, and the integrity you model can have long lasting effects! Come talk with us about unpacking your personal biases and beliefs so you can have the most positive long term influence on the children and families with whom you are privileged to work. Click the link above to visit the 2017 Talks on Tuesdays Archive and scroll down until you find the webinars. This 2-part archived web discussion explores the use of the primary service provider approach and provides information about how the Infant & Toddler Connection of Fairfax-Falls Church has integrated the approach into their service delivery. Click the link above to visit the 2016 Talks on Tuesdays Archive and scroll down until you find both web discussions. This webinar provides information for EI providers about how to determine ratings for children in each of the three OSEP child outcome areas during assessment. Click the link above to visit the 2012 Talks on Tuesdays Archive and scroll down until you find the webinar. This video features a physical therapy panel discussion about implementing a primary service provider approach in early intervention. This poster and corresponding handout PDF include information about the continuum of traditional versus routines-based interventions. Materials were presented by the ITC professional development team at the DEC 2013 conference. This Power Point presentation offers information about using adult learning principles and embedded interventions to build the capacity of families to support their children’s development. Strategies such as coaching based on family priorities are also discussed. This technical assistance PowerPoint presentation provides an overview of the role of EI service providers, different research-based EI service delivery approaches, and implementing team-based service delivery in the EI process (including coaching). This CASEtool describes family-centered helpgiving practices and the benefits of their use during early intervention. A family-centered practices checklist is included, along with instructions for its use. This CASEtool includes a description of the development and use of two Checklists for Providing/Receiving Early Intervention Supports in Child Care Settings. The checklists are based on the current evidence for use of natural learning environment practices and coaching as an interaction style for building the capacity of the child care provider to promote child learning and development. This tool defines coaching and describes coaching characteristics. The Coaching Practices Rating Scale is included, along with instructions for administering the scale. This decision tree can be used by programs and practitioners to make decisions about whether a specific strategy can be considered “evidence-based” and appropriate for use with families. This checklist includes practices for engaging parents and other caregivers in using family capacity-building practices to strengthen parenting con¬fidence and competence. The family capacity-building practices are used by a practitioner to promote a parent’s understanding and use of everyday activities and routines as sources of child learning opportunities. The checklist can be used to plan capacity-building sessions or to do a self-evaluation to determine if practitioner family capacity-building practices actively involved parents in providing their children everyday learning opportunities. To learn about family capacity-building, visit the Family Capacity-Building Online Module. This document outlines a 4-meeting orientation process that supervisors and mentors can use with EI service providers to help them prepare to implement coaching and natural learning environment practices. This video features Virginia service providers, families, and administrators as they describe early intervention. Video clips and photos are also featured to help viewers understand what early intervention looks like and why it works. This video provides an overview of the importance and impact of early intervention. Insights are shared from physicians, parents, and EI service providers. This is the first in a three part series of short videos featuring three current early intervention service providers sharing their insights into providing supports and services using a routines-based approach. Part 1 features an experienced interventionist sharing her personal journey from a clinical approach to one focusing on family routines and activities as the context for effective early intervention. This is the second video in a three part series. Part 2 features three early interventionists discussing and demonstrating what intervention looks like when it is provided by collaborating with families during their natural routines and activities. This is the third video in a three part series. Part 3 features three early interventionists sharing their insights about how they evolved their practices towards a more effective, routines-based intervention approach. This 10:50 minutes video discusses and shows the many benefits for supporting Early Intervention services for children in their child care setting. EI providers, child care providers and families share their experiences of how this partnership benefits everyone involved. Erin describes how early intervention has helped her son, Arlo, thrive. Kurt describes how well his daughter Chloe has adjusted with a solid foundation from early intervention. Carol describes how she believes that early intervention saved her son’s social-emotional life. This video shows and discusses what families can expect on early intervention visits. The video was developed by Connecticut's Birth to Three System but can be very useful for any family who is new to EI. The video includes explanations about a primary provider model, parent coaching, and using typical daily routines as the context for intervention. The video is also available (YouTube, video) in Spanish. In this video, a home visitor discusses and demonstrates safety tips that should be used before, during, and after home visits. Just Being Kids is a collection of six video clips that illustrate recommended practices in early intervention. Developed by The ENRICH Team at JFK Partners in cooperation with the Colorado Department of Education and originally published in 2001, the six stories feature early interventionists working collaboratively with families to achieve meaningful outcomes for their children in everyday routines, activities, and places. In each story, the family members and providers offer poignant reflections on their experiences. The six stories from Just Being Kids can be downloaded for free for use in professional development activities according to the limitations described on the videos’ webpage. These videos are also available on DVD. The purpose of the FIT FOCUS Video Library is to share information with early intervention practitioners and families by providing illustrations of evidence-based and recommended early intervention practices in New Mexico. Please check back from time to time as new videos will be added. Visit this site to watch videos of EI service providers using the FGRBI approach, which includes caregiver coaching strategies. Videos demonstrate the use of coaching practices during intervention visits with families and include interviews with families and providers. This is an important video for families who are, or will be, receiving early intervention services as well as for current and future early intervention practitioners. In Part 1, Karis and Mike share intimate reflections about their daughter's birth and early months in the NICU; in Part 2, Karis articulately describes and illustrates the role of early intervention in their lives. Edelman, L. (Producer) (2017). Published collaboratively by the Center for IDEA Early Childhood Data Systems (DaSy); the Early Childhood Technical Assistance Center (ECTA); the Desired Results Access Project, Napa County Office of Education, funded by the California Department of Education, Special Education Division; and collaborating partners. This video describes the importance of supporting families, collecting data on family outcomes, and using the data to improve the program. Using the family data collected by the U.S. Department of Education's Office of Special Education's Part C/Early Intervention Program as an example, this video highlights how three families who received early intervention benefitted from support to their family. This video is a companion to the video Child Outcomes: Step-By-Step. These practice guides are intended for practitioners to share with families during interactions that reflect the DEC Recommended Practices. These guides address assessment, environment, instruction, interaction, and transition. Each practice guide includes a handout and a video demonstrating the practices. This site provides links to websites and presentations about the most commonly mentioned service delivery models and approaches in early intervention. Formerly NECTAC, the ECTA Center provides links to many resources related to the implementation of Part C and Part B of IDEA. Review this PDF for more information. These training modules consist of downloadable handouts, checklists, activities, and resources that you can use to train yourself or your staff on these topics. You will find a wealth of resources here! This site provides information about key elements of family-centered practice and provides overarching strategies for family-centered casework practice. This site provides a great deal of information about the FGRBI Model, including downloadable resources that can help EI practitioners provide intervention that focuses on family routines and support. Home Visiting Evidence of Effectiveness (HomVEE) was launched in fall 2009 to conduct a thorough and transparent review of the home visiting research literature and provide an assessment of the evidence of effectiveness for home visiting program models that serve families with pregnant women and children from birth to age 5. Visit this site to review the executive summary of findings and learn more about the home visiting programs included in the study. This database contains literature that supports the 7 Key Principles identified in the Mission & Key Principles of Providing Early Intervention in Natural Environments (external website, pdf) document. You can search the database by citation, word or phrase, principle, type of literature, discipline, disability, demographics, or age of children addressed in citation.